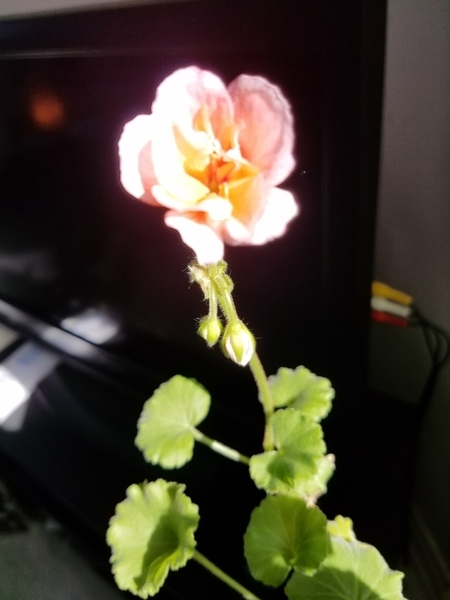 This entry was posted in Seasonal and tagged beauty, flowers, geranium, shamrock, spring. Bookmark the permalink. This is like seeing miracles. Thank you, Debbie. Well said, John! Thank you for reading. I loved it, too, Miss A. Who knew he was so poetic?!? Really? I’m so glad to be the one to let you know that, FF (makes me feel like I’ve reciprocated a bit of the “learning” you’ve provided me, ha!) I’ve seen blooms in both white and pink, though not on the same plant. No scent to them, but very delicate in appearance. 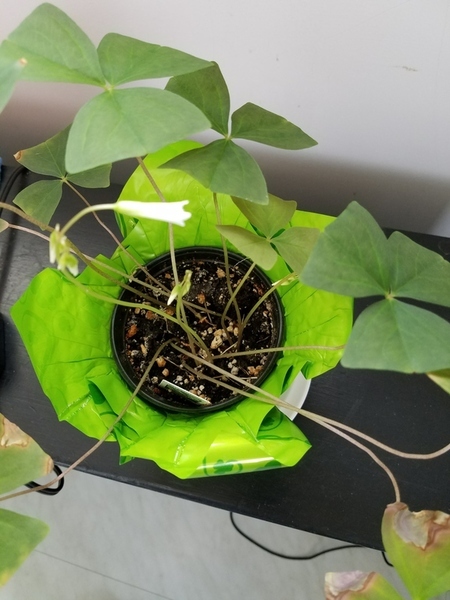 My shamrock plant is not looking very lucky. More like droopy and sad. Why, Debbie, Why??? Love the quote. A lot! Oh, dear. A shamrock in need of some TLC. Hmm, have you watered it, fertilized it, and placed it in a sunny window? Could it be pot-bound and need replanting? I’ve found that the less I mess with mine, the better it likes life. For a while, it was looking pretty droopy, but I added a bit of Epsom salt and it perked right up! Maybe it would be interested in an Irish joke or two!! The joke might have worked. Murphy seems to have perked up a bit and is even showing off a few flowers. Epsom salt? I always have on hand. I’ll try it. Thanks! Great! Remember, it’s a fertilizer, not a bomb, meaning it won’t work its magic overnight! Debbie, I absolutely LOVE the Chinese Proverb you shared at the top of this post, it’s FAN-TAS-TIC! Lovely photographs as well! Yes…I DO remember these beauties! I’ve been noticing the flowers and cherry blossom trees ever-so starting to bloom in Philly. I’m looking forward to the magnolia’s! Happy Spring, my friend! And Happy Pre-Easter to you and your family! I’m glad you like the quote, Ron. It speaks to me, too, and has for a long time. Only makes sense for us to nourish our bodies with food and our souls with beauty, right? I do hope you’ll be able to capture some of those cherry blossoms in photos on your blog! I know it’s probably not feasible for you to get to D.C., but if you’ve got cherry trees in your area, that would be splendid! I love seeing those things in bloom. Somehow I missed realizing that our oxalis and the shamrock are related. Both are beautiful — as is your geranium. There’s nothing like seeing a bloom finally emerge to bring a smile, and a sigh of gratitude! Thank you, Linda. Of course, I haven’t set them outside yet because our weather is still on the iffy side, but I imagine they know Spring is near and are eager to feel the sunshine on their leaves again. I’ve seen daffodil and tulip leaves popping up, too, but no flowers yet. Feels like we’re way behind the calendar for some odd reason!